just a side note here, personaly I wouldn't cement your rock togeather.. just think of the mess if you had to remove some rock to get rid of a nucence algae or to catch a fish.. if you are dead set on cementing it togeather then I would recomend doing it in managable chunks so you can remove stuff if you have to. Some strive to be perfect.... I just strive. Here is an arch that we managed to create over the weekend. The two joints don't look very natural but hopefully with time the coraline and what not will blend them in so they aren't as noticeable. Next attempt will be a pillar of some sort. I built a bunch of rock for my tank a few years ago. Instead of stacking like you did I filled a box with marine grade sand, hollowed out the shapes I wanted and then filled them with my mix. That way you don't have to support the structure and you can make some wild shapes, caves, etc. And the finished product looked very natural. Hey guys. How did this workout for you guys now that it's been so many years? Held strong? 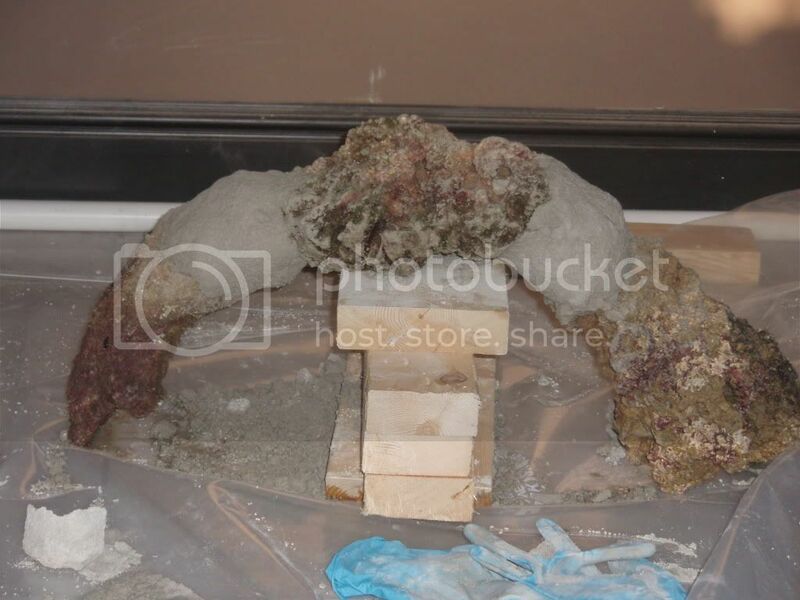 Would you recommend cementing your aquascape together? Or did it cause problems? My tank is still using rockwork that was bonded into shapes using the stuff I found. FWIW I don't even think "Emaco Architectural R400" exists anymore either, it's called something else now (because why not change the name a bunch more times). I have no idea if it still sets at a neutral pH. I would presume so but would be worthwhile researching or experimenting first before going full on with it in a new tank. My next hobby will be flooding my basement while repeatedly banging my head against a brick wall and tearing up $100 bills. Whee! I'd love to see pics if you have any Tony? I took the tank down long time ago, so really can't comment much on it long term. I have used the Reef Crest Aqua Weld and it worked not bad for cementing rocks, they have a PRO version, not sure what the difference is. What works well is drilling a hole in the rock with a masonry bit and insert a acrylic dowel before cementing, adds a lot more support if doing overhangs etc. Thanks for that tip. I will keep that in mind, now just to find some acrylic rod. I will have to check industrial pairs and plastics. You could also just use a zap strap.